Generally, seasoned wood is seen as the most environmentally-friendly fuel and therefore the one that is the most widely-reccommended. However, it’s important to use only dry wood, which should contain 20% moisture or less. Smokeless coal fuels will produce much less air pollution than regular “house coal”. 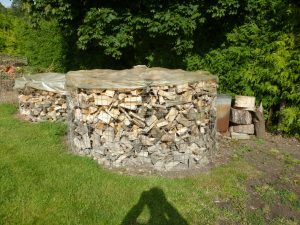 If you are buying for immediate use then look out for the ‘Ready to Burn’ logo or buy from a trusted local source for reassurance that the logs are dry enough to burn. Open fires burn fuel at a much lower temperature than a well operated stove. 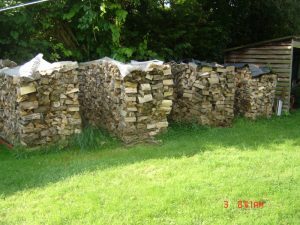 If burning wood, open fire users will get the best results from using dry logs which are not too large and burning them on a properly fitted open fire (not just a recess in the wall). There is a specific problem with the types of fuels burned on open fires in Smoke Control Areas – (smokeless zones). This means that wood or normal “house coal” must not be burned on an open fire. They may only be burned on a stove that has been exempted for use in a Smoke Control Area. 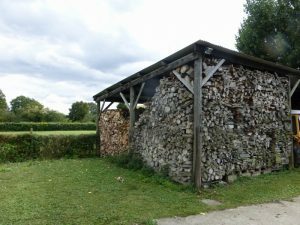 These log stores will dry the wood properly and keep it dry.